On December 30, Class and Component prices were announced. 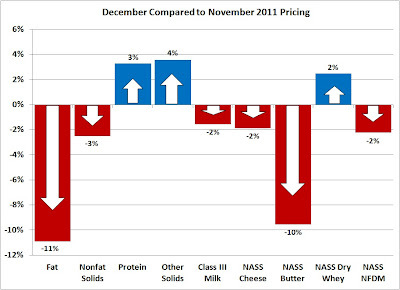 Although the dashboard shows a lot of red, Class III milk prices stayed high, down only 2% from the November's high prices. 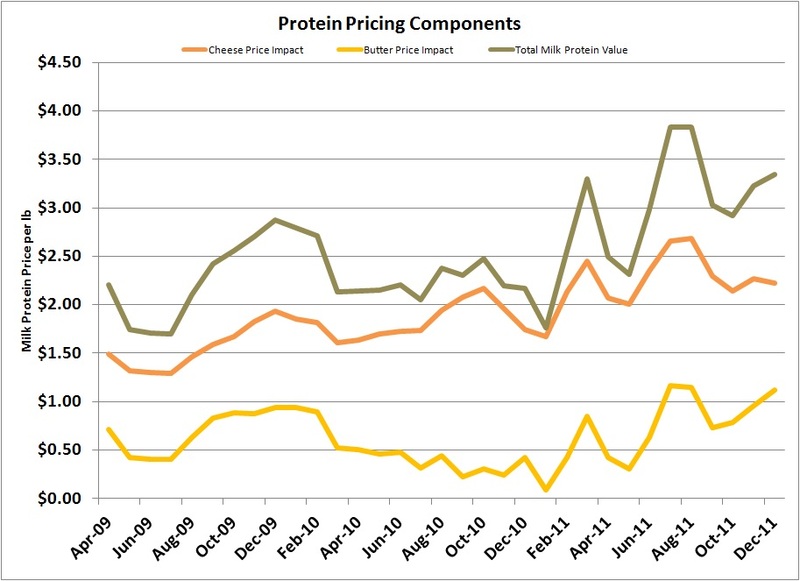 Cheese prices were down slightly and typically this would negatively impact protein prices, but butter prices were down significantly which improves the protein price (explanation below). 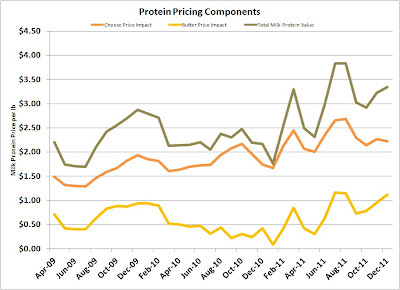 As a result, protein actually increased slightly to $3.34/lb. This brought the pie chart to a more normal relationship with protein making up 53% of the milk check. 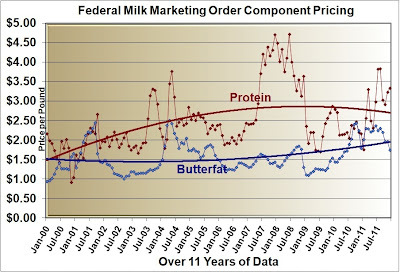 The long term trends are also returning to more normal values with protein well above butterfat prices. The price of protein is based on one of the more complex dairy formulas. The first part of the equation establishes the relationship between cheese and protein by removing the cost of making cheese (the make allowance), leaving the raw material cost times a yield factor. The later part of the equation computes the premium that butterfat carries when used in cheese rather than butter. Therefore, the two parts of the protein value combine as shown in the chart below. 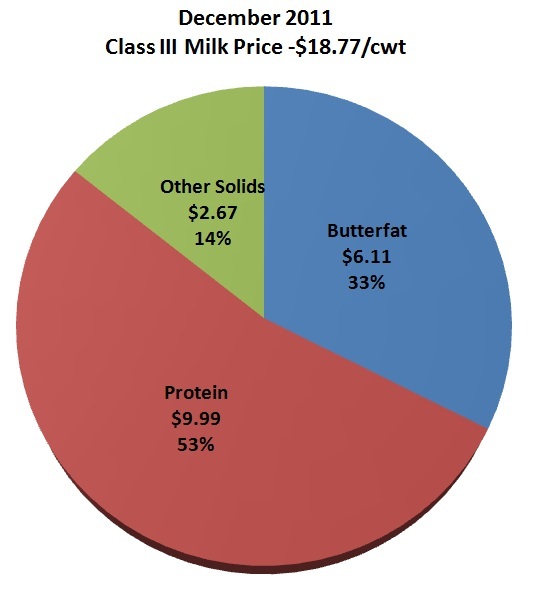 When the price of butter drops, the butterfat is worth more in cheese than in butter and that differential is added to the protein price, because the protein is needed to capture the butterfat in cheese making. 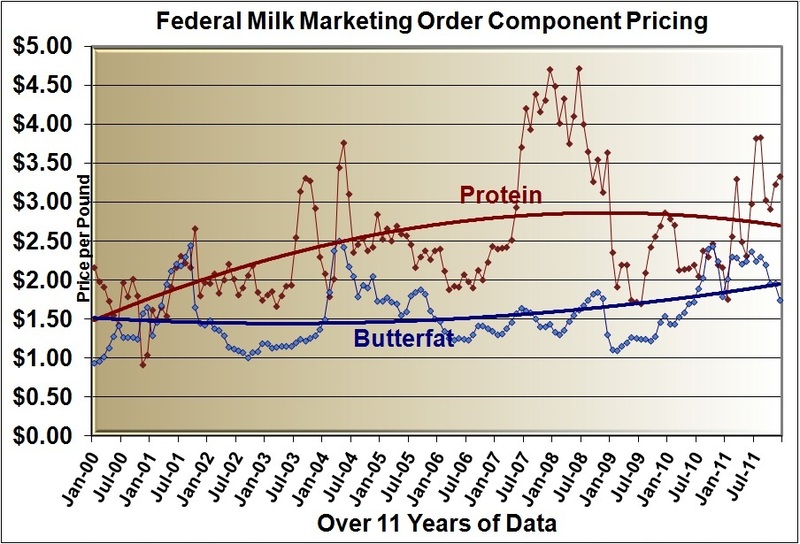 In the month of December, the cheese price decline actually reduced the price of protein (the orange line) but, the butter price decline helped increase the price of protein (the yellow line). While this relationship may seem a little convoluted, there is some logic behind it. 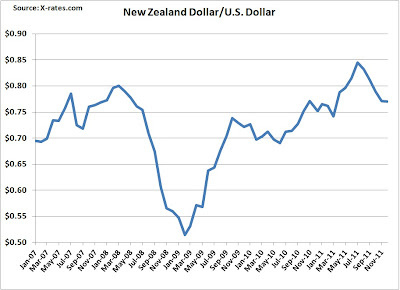 Exchange rates have a significant impact on exports of dairy products. The main competitors come for the EU and New Zealand. In early 2008, a very weak USD caused a big increase in exports and resulted in high milk prices. In 2009, the currency exchange rates reversed and sent exports plunging along with milk prices. 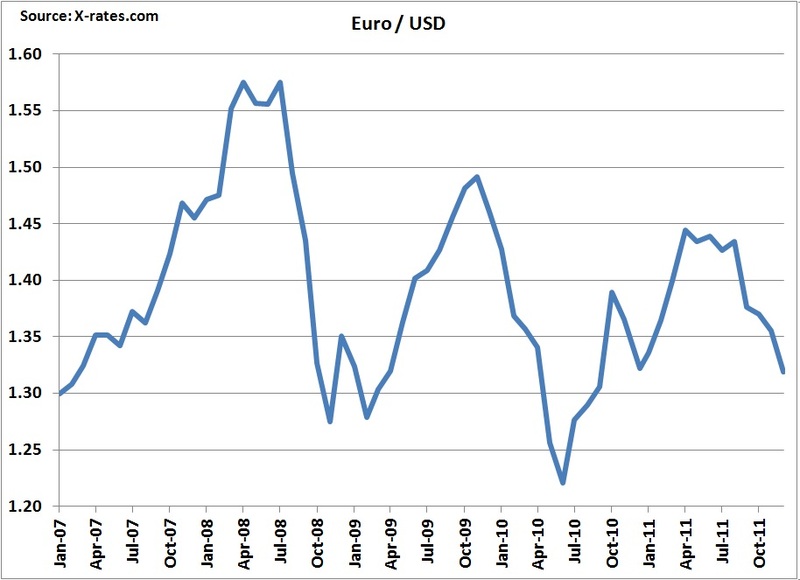 The USD has strengthened in recent months as compared to early 2011. 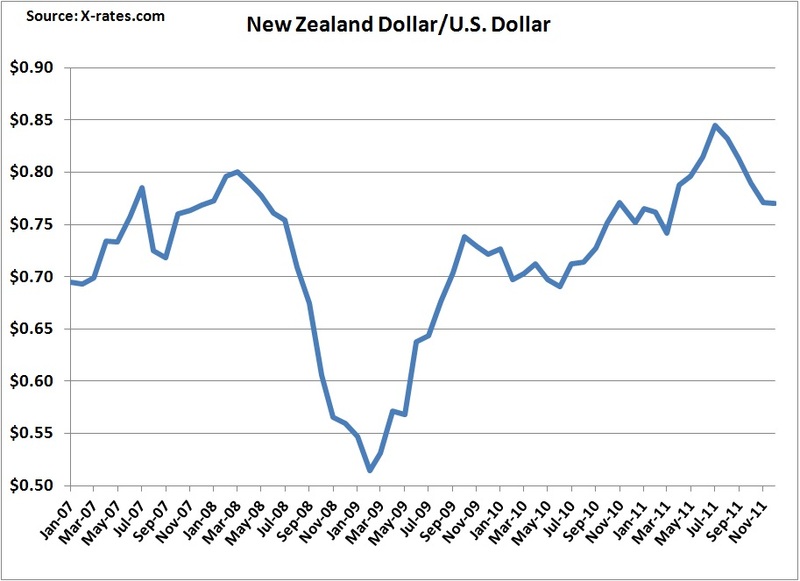 The New Zealand dollar weakened some, but not as drastically as the Euro. These currency fluctuations have a significant impact on exports (and imports) as will be shown below in the export numbers for cheese and butter. 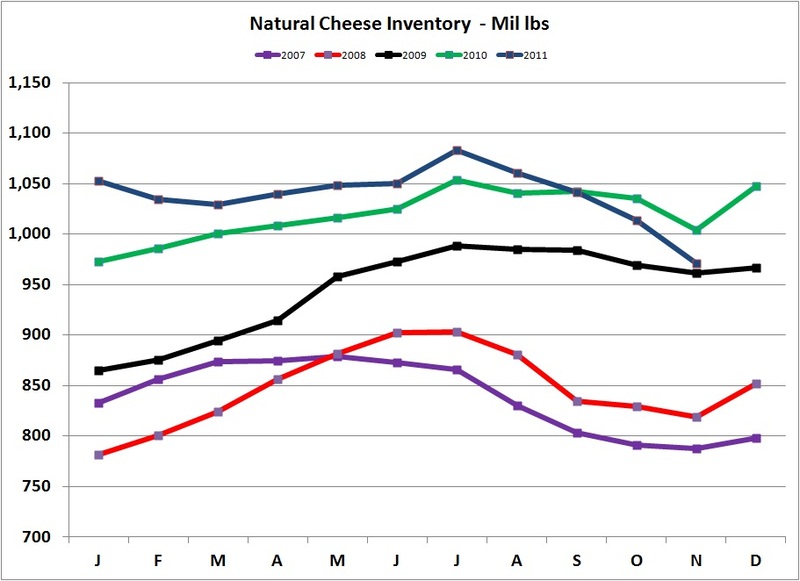 Inventories of both natural and processed cheese continued their decline. 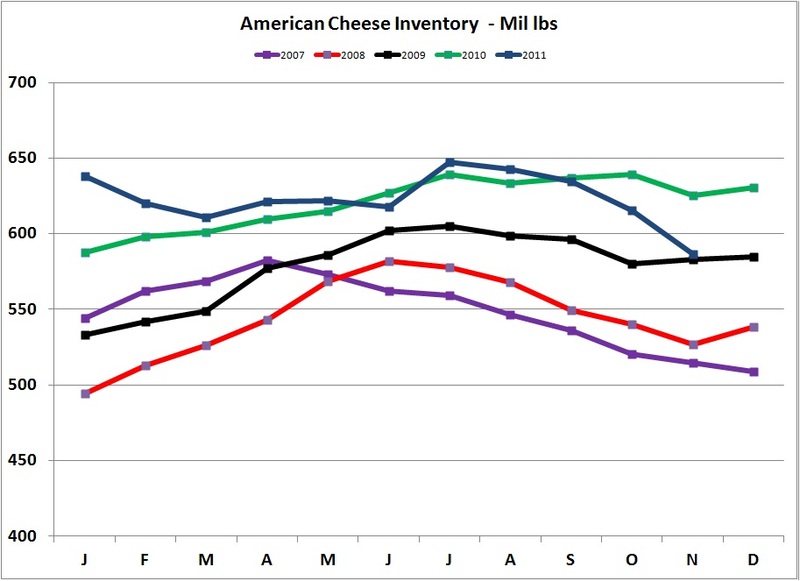 Tighter inventories do have a positive influence on cheese prices. 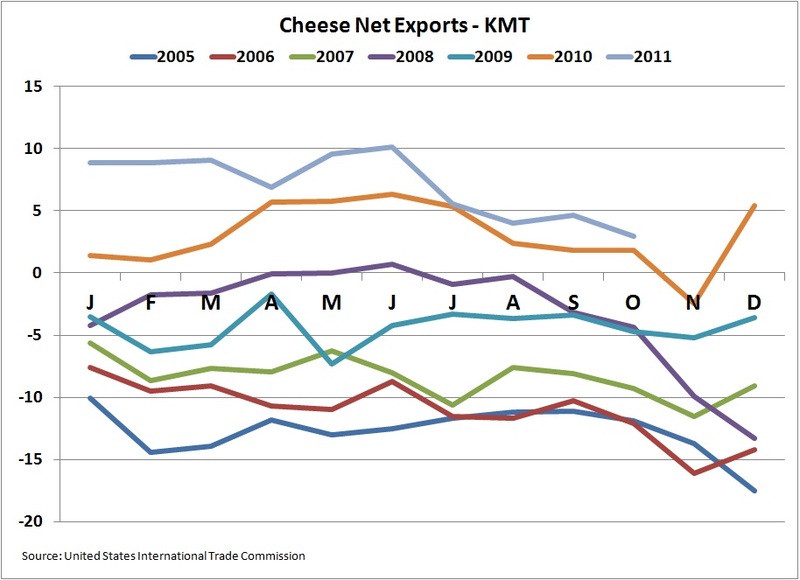 Exports of cheese are the most volatile factor in cheese supply and demand. Exports data lags by about two months, but exports appear to be in a decline despite of the excellent programs supporting exports. 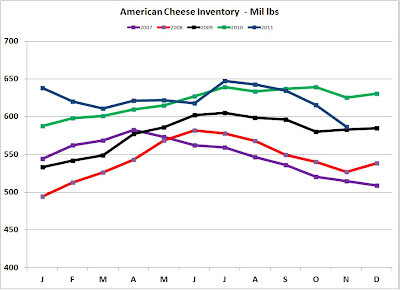 The increased strength of the USD mentioned above appears to be working against exports which leads to an undesirable impact on cheese inventories. 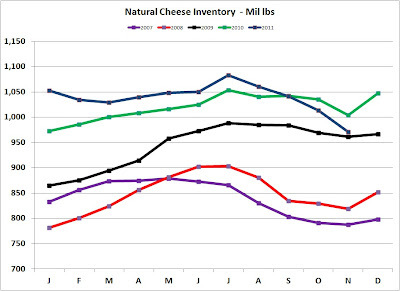 An increase in cheese inventories would reduce current prices and have a significant impact on Class III milk prices (see example below in "FUTURE PRICES"). 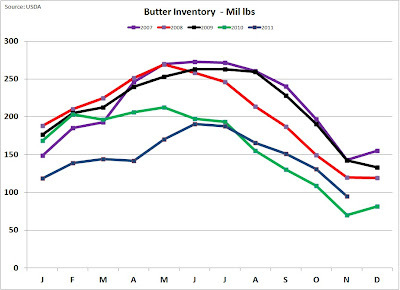 Butter inventories remain relatively tight, but not as tight as last year. 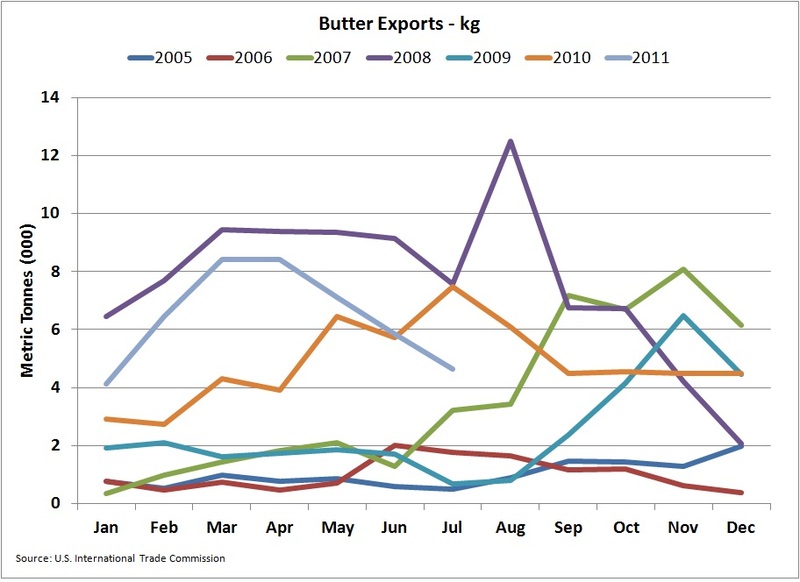 It appears that tight supplies will continue to keep butter prices above historical levels. 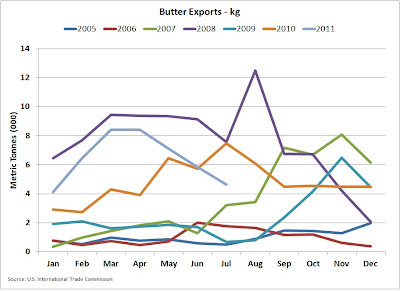 Similar to cheese, butter exports are off and below 2010 numbers. Again, the strength of the USD is working against us. 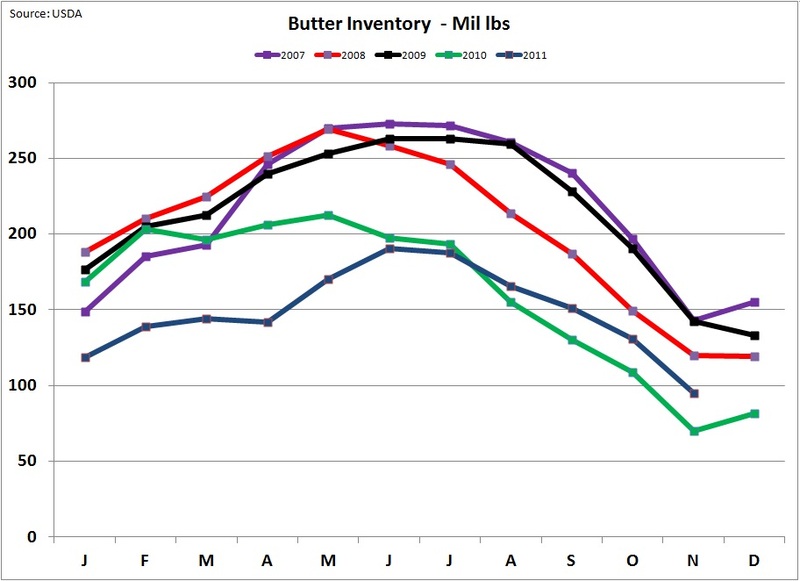 This may influence inventories and reduce butter prices. Future prices are headed in the wrong direction. 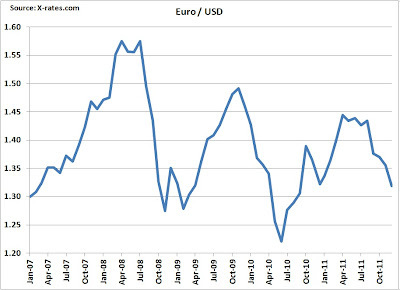 The impact of the strong USD is a significant factor. Cheese prices have the most influence on Class III milk prices which is the basis for more than 50% of the U.S. milk payments. 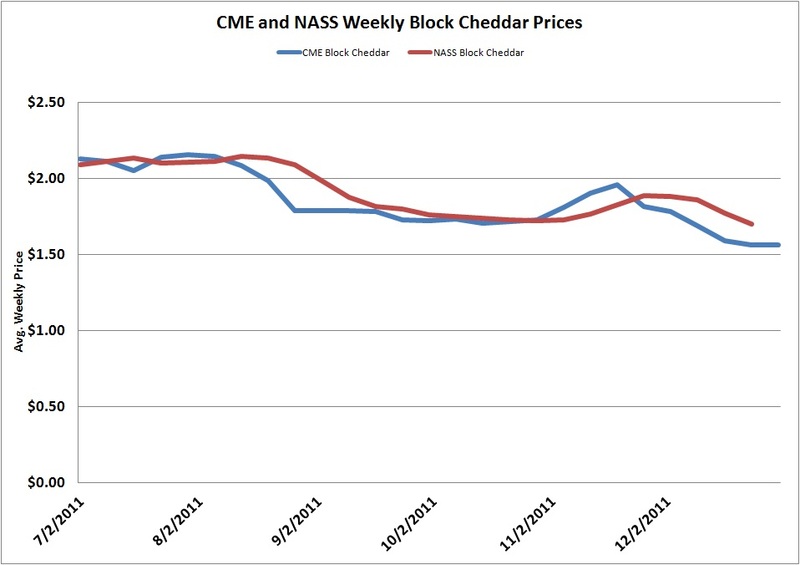 While the NASS cheese price for December was $1.81/lb, current CME prices are running around $1.56/lb, a $.25/lb drop. This would drop Class III milk prices by about $2.40/cwt or around $16.40/cwt. In another four weeks, we'll know if this really happens. There is about a two week lag between the NASS and CME prices and the CME prices are published faster. 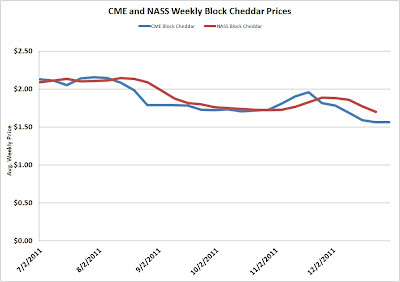 As shown in prior posts to this blog, when the two week lag is taken into account, there is a very high correlation between the CME and NASS cheese prices.